The temple’s origins date back to 1859 and it is dedicated to Lord Murugan, the six-faced patron god of India’s Tamil Nadu state. 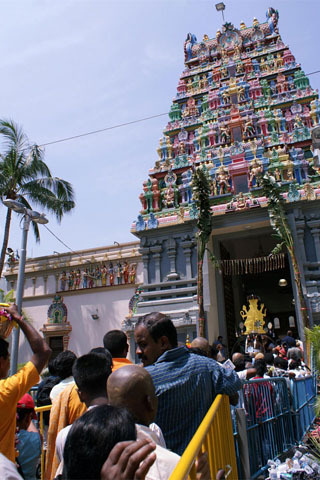 Every year around January or February the temple acts as the end point for the dramatic Thaipusam festival, a procession of people who pierce their bodies and carry spiked metal cages to show their devotion to Lord Murugan. On most days the temple is less bloody and it hosts weddings and daily pooja (religious offerings).